As Lawfire readers know, one of the purposes of the Center on Law, Ethics and National Security (LENS) is to develop the next generation of national security leaders. To that end, at the LENS Conference this year we inaugurated the “LENS Scholar” program where nominated law students from more than a dozen institutions attended. They benefited from the opportunity not only to hear the rich variety of speakers and panelists, but also to network with experts – and get to know each other. Our guest essayist today is Sai Santosh K. Kolluru who was part of that initial cadre of LENS Scholars, having been nominated by the very distinguished scholar, Professor Laurie Blank. 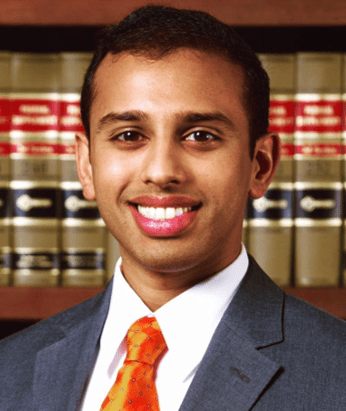 Mr. Kolluru is a third-year law student at Emory University School of Law, and as a member of school’s International Humanitarian Law (IHL) Clinic his research focuses on a variety of matters related to IHL. He holds a bachelor’s of science in mechanical engineering. We want to give our LENS Scholars a voice, so I invite you to read Sai’s very interesting analysis of the President’s use of the social media phenomena of Twitter. On April 7, 2018, reports surfaced of a major chemical weapons attack in Douma, a suburb outside of Damascus, Syria, killing at least several dozen civilians. This followed smaller chlorine gas attacks that were reported in Douma on March 7th and 11th. On April 11, 2018, President Trump tweeted, “Russia vows to shoot down any and all missiles fired at Syria. 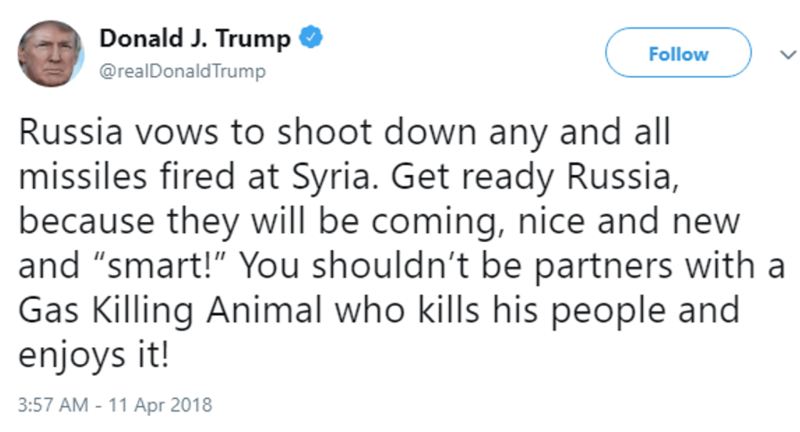 Get ready Russia, because they will be coming, nice and new and “smart!” You shouldn’t be partners with a Gas Killing Animal who kills his people and enjoys it!” On April 13, 2018, the President launched air strikes at select sites containing chemical weapons in Syria, in coordination with Great Britain and France, but without seeking or obtaining congressional authorization. Under the U.S. Constitution and the War Powers Resolution, the President’s constitutional authority to launch military operations without Congressional authorization is limited to repelling an attack on the U.S when war is “thrust upon the nation,” whether by a foreign force or states in rebellion per the President’s inherent Article II defensive or responsive war authority. Additionally, exclusive powers of the president also include all tactical decisions related to ongoing or anticipated hostilities since such decisions are quintessentially within the Commander in Chief power as well as the authority to use military force to rescue U.S. nationals abroad. 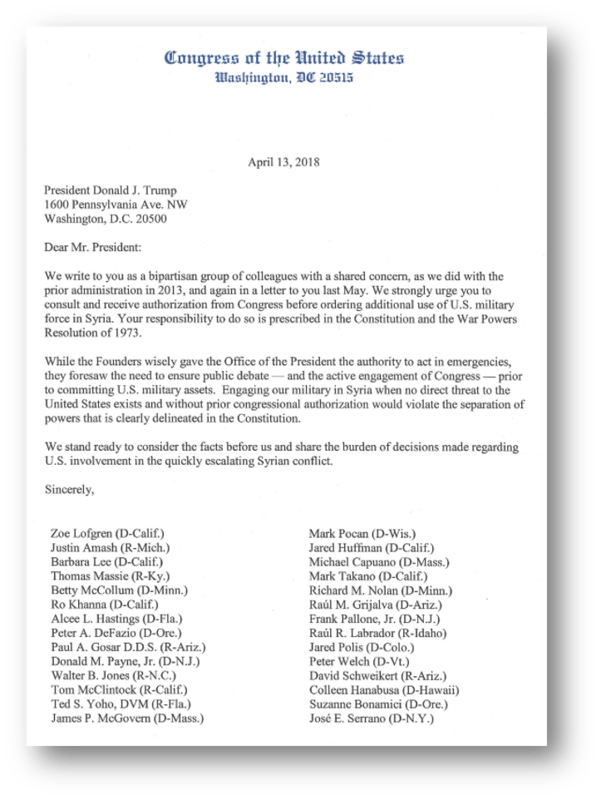 While 88 lawmakers have urged the President to consult Congress before the air strikes, the President’s tweet on April 11th effectively announcing the use of force raises an important question: did the President act unilaterally or with Congressional acquiescence because Congress was silent after some knowledge of an impending launch of military operations? In other words, can a tweet constitute “consultation” or “notification” of Congress? These questions may seem far-fetched or simply amusing, but as we look forward to the future, this use of social media may portend an entirely new conception of Presidential communication with Congress and therefore of the war powers interplay between the two branches. 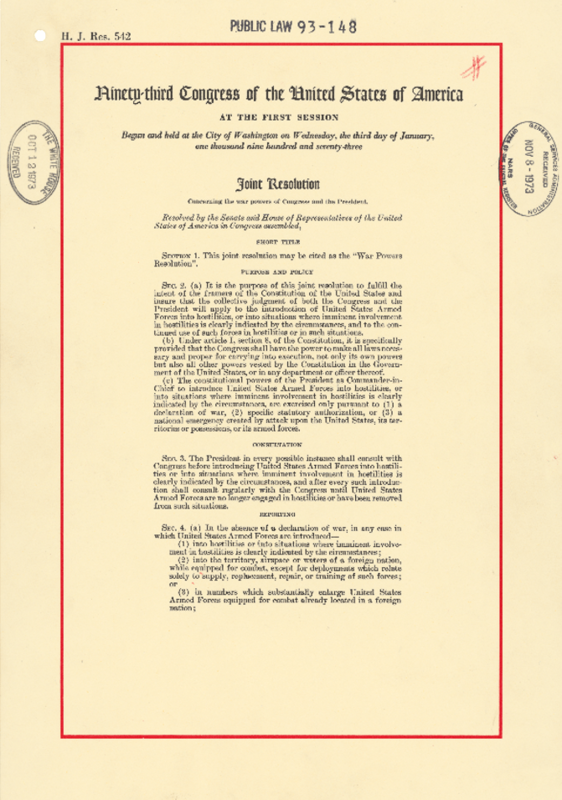 The War Powers Resolution sought to address the gap left by the second category, which allowed Presidents to argue that Congressional authorization could be based on “implied support,” such as conscription, appropriations or similar statutes, even in the absence of express authorizations for military action. It also sought to eliminate reliance on historical practice to demonstrate congressional acquiescence. No President has accepted the constitutionality of the War Powers Resolution — and so the constitutional custom of acquiescence remains important. President Trump’s tweet raises the question of whether congressional acquiescence could be based on some argument that tweeting gives Congress notice and congressional silence in response constitutes acceptance. Or, could the tweet be considered to fulfill the consultation or reporting and notification requirements in the War Powers Resolution? And if hostilities are introduced, does the President’s tweet have any bearing on constitutional authority or duties if hostilities extend past the 60th day? 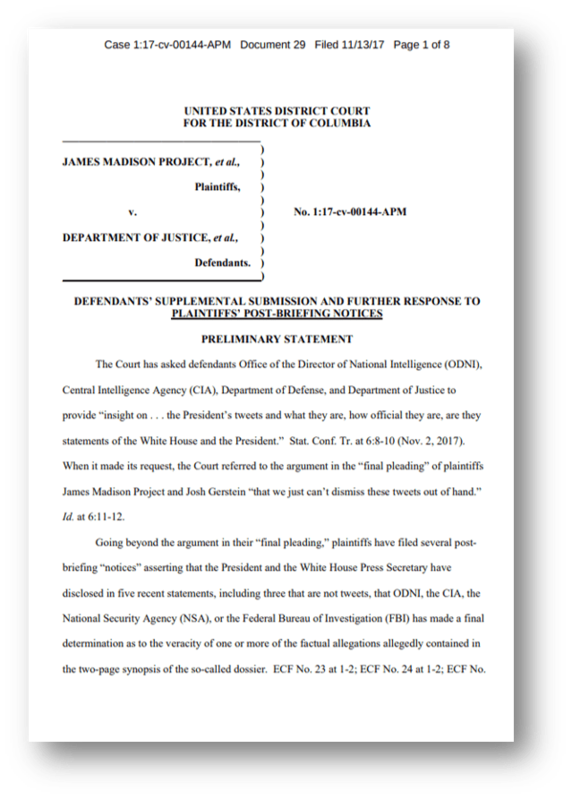 The DOJ also stated “a First Amendment claim can be directed only at state action, not the president’s personal use of social media.” This leads us to ask the question: are the president’s tweets personal statements and thus, shielded from First Amendment claims but are official policy statements when it comes to the President’s exercise of his Article II authority as Commander in Chief? While the answer to this question is currently in debate, the President’s tweets on appointment and firings of his cabinet members seem to support the view that the President’s tweets are “official statements” rather than those expressed in a “personal use” capacity. Consider this in the War Powers resolution context. Perhaps the tweet means that the President is consulting with Congress, giving Congress two days to participate in the decision-making process and enabling Congress to fulfill its constitutional war authorization role. Perhaps the President is notifying Congress and reporting under §4(a)(1) that U.S. forces are being introduced into hostilities or a situation where hostilities are imminent. If that is the case, then the 60-day clock starts ticking as soon as the President tweets. If the President’s tweet is an “official statement,” then how is it different than a traditional physical, formalized copy of such a report? When exactly then does the 60-day clock start, at the time of the tweet or at the time the traditional war powers report is submitted to Congress? The answers to these questions pose a 21st century problem: presidential actions based on tweets or other social media methodologies. 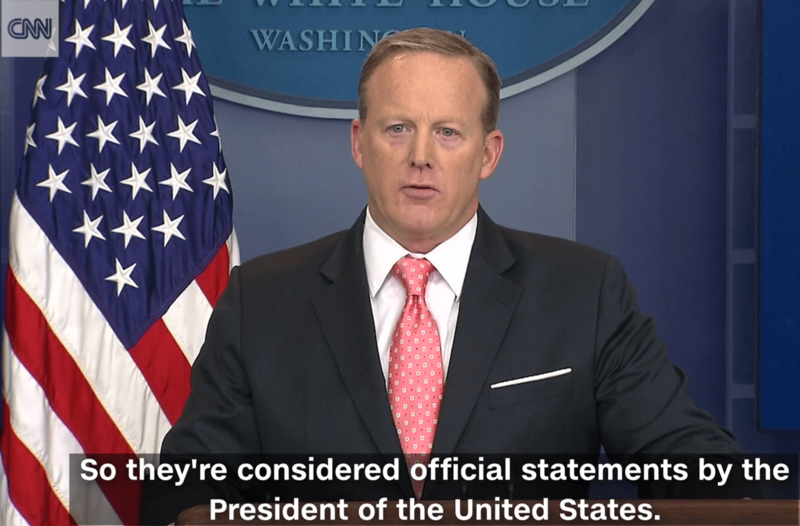 Perhaps one way to clarify such communication is to preface every tweet with: “Personal Statement,” “Official Action,” “Policy Statement,” or “Media Announcement.” Such notation or categorization can serve many purposes, but most importantly preserves the President’s desire to communicate directly with the American people while helping his administration as well as Congress understand his precise position. In the War Powers context, this clarity empowers the President to determine the form of consultation or notification, signaling to Congress to fulfill its constitutional war authorization role. It is clear that the increased use of technology has dramatically changed the way public servants communicate with their constituents. With this opportunity to connect instantly in 140 characters also comes the responsibility to communicate the intent behind those characters with the utmost clarity. If the President’s tweets are “official statements” and indicate Presidential policy, then it is important for Congress to seriously consider such statements in light of the President’s exercise of his Article II authority. It is clear that the President delivers on his statements via Twitter; it must be clear that Congress will exercise its authority and act in response. Given the increasing ubiquity of social media, today it may be time for Congress, working with the Executive Branch, to formalize how the respective branches of government will communicate with each other. In questions of peace and war especially, there is no room for uncertainty. And as we like to say on Lawfire, gather the facts, examine the arguments, assess the law, and decide for yourself! Does the Constitution really require the military to induct everyone who wants to join?